Although I don’t believe I’ve ever owned one, the straight pot is always a fascinating shape for me. It seems so massive, so pulled down by gravity, heavy and full: the double bass or timpani, if you will, of the Classic Range shape chart. 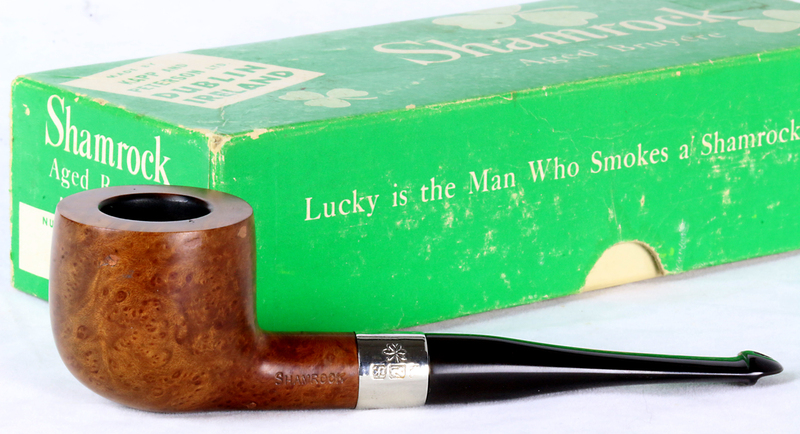 Being attracted to this kind of design language, when I saw this Peterson Shamrock 608 recently on eBay, it being a rarely-seen shape, I thought I’d give it a closer look. Peterson’s “600” group is quite small in number and I’ll document it later this week. For now, I want to use this 608 as a good platform for thinking about the general state of pipe restorations being done at the moment. When I took up the pipe in the 1970s and 80s pipe smokers were mostly S.O.L. when it came to getting their pipes cleaned and restored. I’m sure there were fabulous full-service tobacconists scattered across the globe, but most of us simply endured our green oxidized stems and buttons which we would sometimes attack with toothpaste or other home remedies, or in desperation take to our local B&M, only to have them buff the hell out of it, transforming its dull green and brown to a shiny green and brown for $5 or so. You’d have to ask Steve Laug about this, but it seems to me that restoration as a serious DIY phenomenon began just a few years before my wife bought me my little Foredom buffer back in 2008 and after getting some advice from Mike Glukler of Briar Blues and a few others. I suspect that the number of amateur and professional pipe restorationists has probably been on a parallel track with the increase of artisan pipe makers and will soon equal the number of people who actually smoke pipes! Jesting aside, the thing I want to call your attention to is the curious phenomenon of amateur vs. professional restoration. 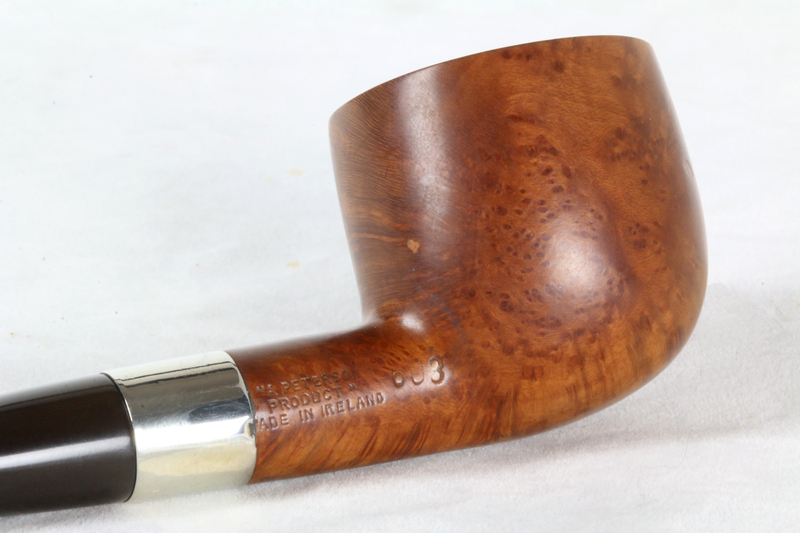 My assertion is that, with a few notable exceptions, you’re going to get a better restoration on most eBay estate pipes from a talented amateur than a professional. I say this because restoration is a time-intensive process, and amateurs who restore pipes for pleasure have the curiosity about their craft and willingness to spend the time with it that professionals either won’t take or feel that in the “time = money” equation they can’t take. It’s not that most folk selling pipes on eBay are out to rip anyone off, simply that they’re using the skill set they have, or if they’re in it to make money, it’s probably hard for them not to have one eye on the clock. The first time I noticed this was a few years back when I got interested in the 05 System shape and found a beautiful 1984 Premier calabash (first year of issue) which I obtained from a long-time eBay dealer. 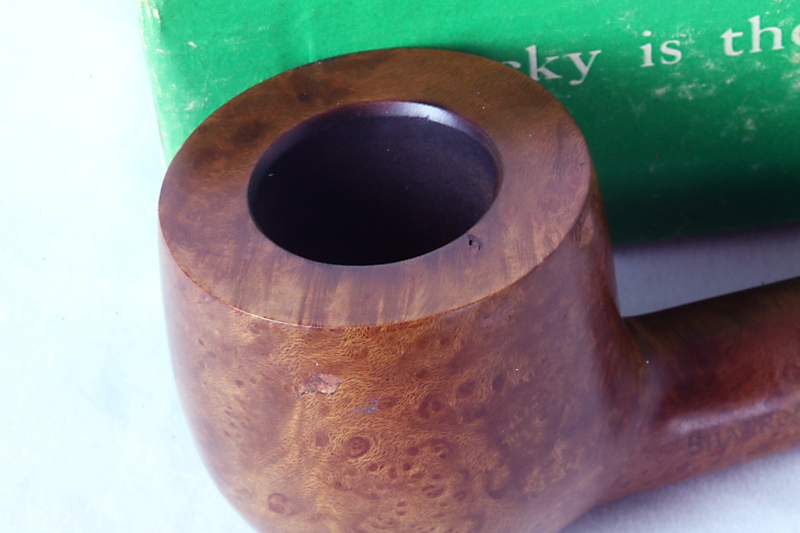 When I received it and could examine it for myself, I discovered both tobacco ghosting and a lack-luster finish, neither of which were apparent in the description or photos. It was “clean,” but somehow not. Finding I wasn’t smoking it because it failed the Aesthetically-Pleasing Test, I decided to try and refresh it. Vigorously wiping the bowl’s surface with an isopropyl-soaked cotton pad, it became apparent the bowl had been buffed and never truly cleaned on the outside. Stripping off the compound and grime underneath revealed a beautiful piece of wood which, after a salt-solution chamber soak, was also sweet-smelling. I’ve already documented the “shiny outside but secretly filthy inside,” aka Luke 11:39 Phenomenon, with a 107 Kapp-Royal chubby billiard—in that case, it was the sleight-of-hand of the dealer that I think ruffled my feathers: “practically unsmoked,” I believe the description read. I’m not accusing anyone in either instance, but I do believe that providing as much transparency as possible is always the best policy when selling estate pipes. Hopefully you’ve had a chance to read Neill Archer Roan’s definitive guide to buying estate pipes, included as an appendix in Charles Mundungus’s Pipe-Smoker’s Handbook of Really Useful Information at the bottom of “The Pipes of Christmas Past.” Roan anatomizes every possible scenario one might encounter in making an estate purchase, making it possible to at least be aware of the probability of various problems one will encounter when buying over the internet. Let’s take it from the general down to a specific pipe. This Shamrock 608 dates from the first decade of the Early Republic era (1949-1959), and is fairly typical and in many ways better than a lot of estate transactions I’ve had. I bought it on eBay from a very well-known and respected tobacconist and it cost me just over $40. 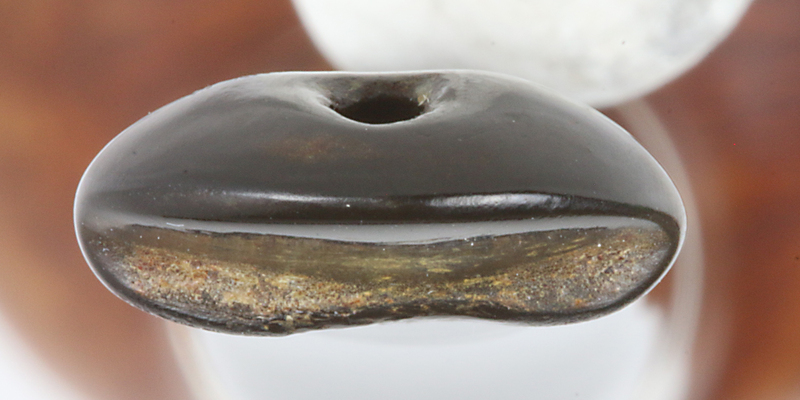 The whole pipe has been buffed with white compound, most of the mouthpiece is black, the cake in the bowl has been reamed fairly well down about 2/3rds of the chamber. I’d give the pipe as received an overall refurb of C+ if you remember letter grading from of old. Given the fact that it’s only an old entry-grade Peterson Shamrock, maybe that’s all it deserved. 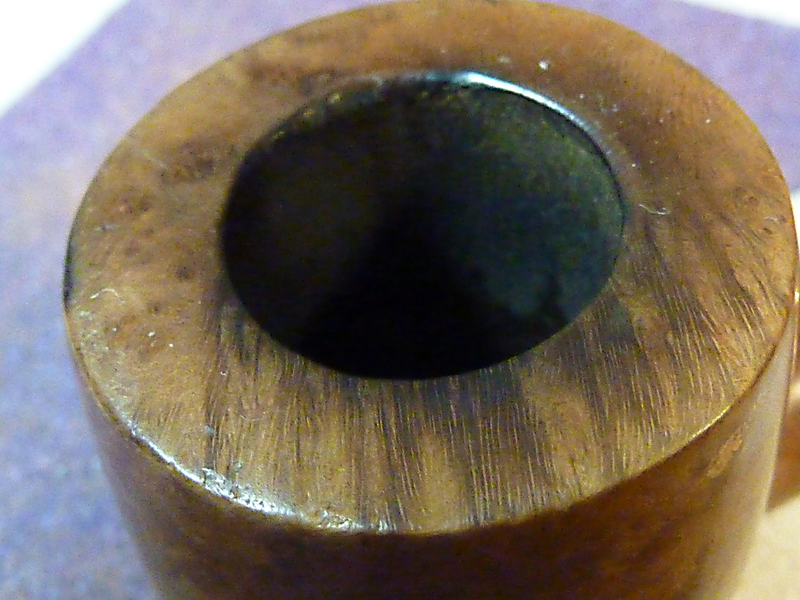 One outstanding item in the pipe’s refurbishment is that the air hole in the stummel has been correctly drilled out, not to open it, but to clean it. The air hole in the mouthpiece is likewise spotlessly clean. As Rick Newcombe and others discuss, this can really make the difference in an estate pipe, both sweetening it and re-establishing good airflow. and there’s not only a significant dental mark near the upper part of the button and a broken bottom shelf, but brown oxidation on both. The air hole in the P-Lip has also been gouged, probably by the former owner, in an attempt to create more airflow (which was probably clogged by poor cleaning in the first place). There’s a slight ghost, either from the tobacco shop it originated from or from previous aromatic tobaccos. Having made these notes, the next thing is to see if my own skill set will be able to make the indicated modifications. 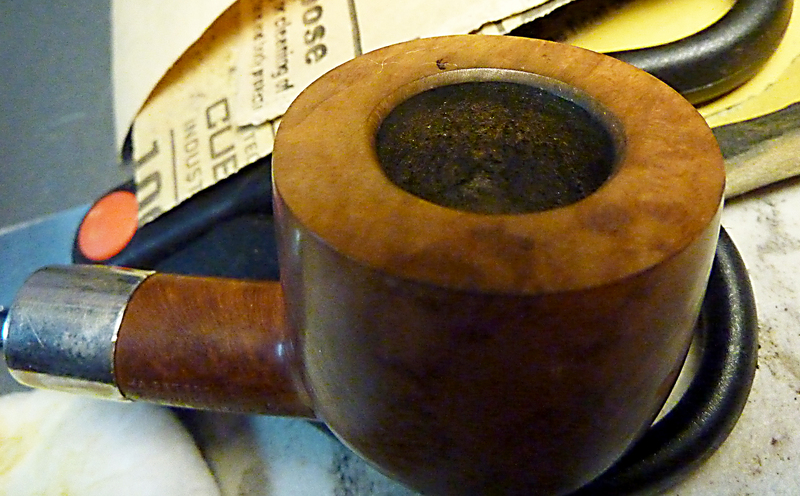 Holding it in my hand, I already know I’m not going to put it in the rotation—the chamber size is right, but the pipe itself is just a little too small for me, in the same class as the 122 dublin and the 440 billiard—so I’m going into this restoration to see if I can at least break even on my investment. After giving the bowl some 48 hours of submersion time in an isopropyl-filled mason jar, I scrubbed it down with a cotton pad only to find that the pipe was, after all, pretty clean. The white diamond did obscure the “meteor shower” on the front of the bowl, which was now quite apparent, as well as minimize the typical fills to be found on a Peterson Shamrock. The dents responded quite well to the application of wet steam heat applied with the flat of a screwdriver through two layers of t-shirting. The light ghost of them that was left vanished completely in the sandpapering process. 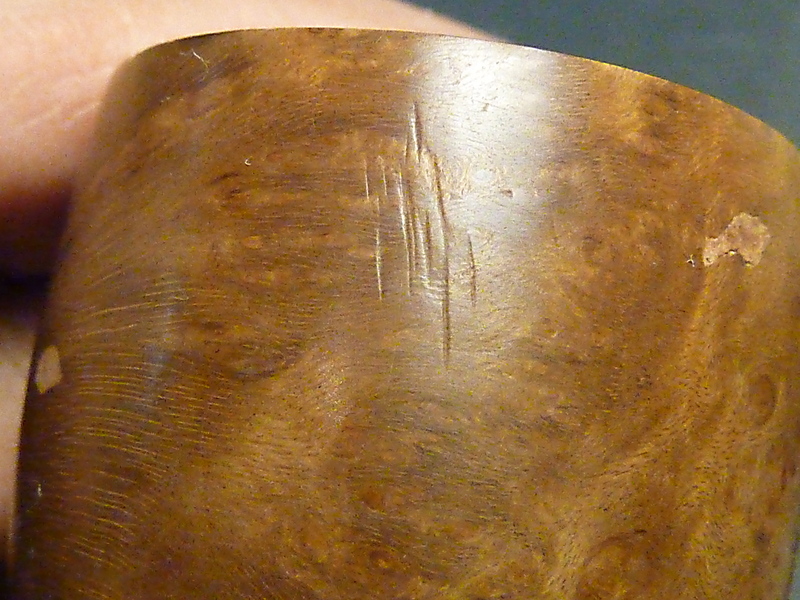 One thing that really detracts from a shape like the pot with its incredibly thick walls, is an out-of-round chamber, caused in this case by reaming with a pen-knife. You can also see a burn mark on the outer edge of the rim as well as the rounding of the crown’s edges caused by 70 or so years of use. If I’m doing a slight rim topping, it begins with multi-step sanding of course. I place the sandpaper on a perfectly flat surface, and hold it as I rub the rim in a circular motion across the paper. The first grit is chosen based on how much I need to take off. Typically, a light topping might start with 150, then 180, 220, 320, 400, 600, then its staining time. Following that, 800 grit and then stain touch up as needed. Then on to 1000, 1200, then micromesh pads: 1500, 1800, 2400, 3200. At that point, I might even rub the rim on the counter top again, with a dish towel held in place on the counter…the same way I did the sandpaper. If the towel has some texture to it, it begins to polish the rim. Now I finish with a light buffing with Tripoli. That may be all it needs. After sanding the crown up to 600, I stopped to stain it, using a very diluted Medium Brown Fiebing’s applied with a cotton-tip swab and burned in with a soft-flame lighter. I followed that with sanding pads as Joe suggests, while simultaneously sanding the entire bowl at the same grades. I’m not complaining, because it looks worlds better with the sharp edges at the rim and the chamber now round with the elegant bevel. . .
Next, I turned to the button and stem. The gouge in the air hole below was probably instigated by a dirty airway which the previous owner sought to clear in part by opening up the P-Lip with his knife. I stuck a fluffy pipe-cleaner through from the tenon-end, coated it thoroughly with petroleum jelly, wiped the grease away the from top of the P-Lip and applied a few drops of black CA glue, spraying it with accelerator afterwards. In a few minutes, the bond having dried, I removed the pipe cleaner and was ready to sand. Refinishing the stem went a little quicker than a totally unrestored mouthpiece, but not much, as the stem, after removing the buffing compound, had only been sanded by the previous restorationist to about 400 grit. 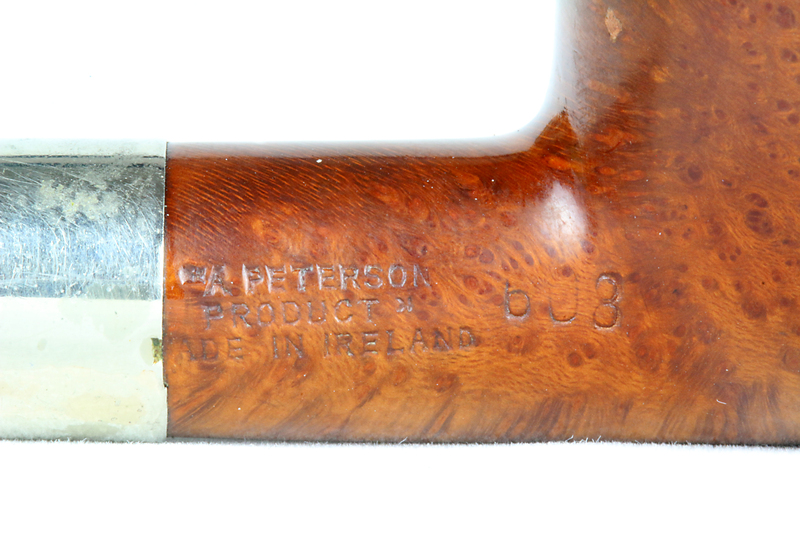 The oxidation on the top and button of a P-Lip is always a problem for Pete lovers. I’ve learned to fold an aggressive-grit sandpaper over a flat needle file to get in close and personal while maintaining the 90-degree upper and lower shelf angles. As you can see, I’m getting better at this. I didn’t show you the partially broken lower shelf visible above, which, while as black as the upper, I couldn’t for the life of me figure out how to elevate and restore. Suggestions, anyone? The black CA glue I used isn’t thick, but very runny, and so wouldn’t just set in place like mortar. The band had the type of tiny scratches typical on nickel that has seen 70 years’ use. I very carefully used white diamond on the smooth surfaces and Fabulustre, a jeweler’s compound, on the faux-marks, being careful not to over buff for fear of removing any of the nickel plate. I decided this time to go with Joe’s implied advice and simply use Tripoli to finish the wood surface, buffing it lightly after having previously sanded it up to 3200 grit with the Micromesh pads. It came out feeling like the Trafalgar Square pipe Joe sent me: very clean and clear, with an exceptionally smooth feel. Finished. Length: 5.00 in./ 127 mm. Weight: 1.1 oz. / 31 gr. Bowl Height: 1.42 in./ 36.29 mm. 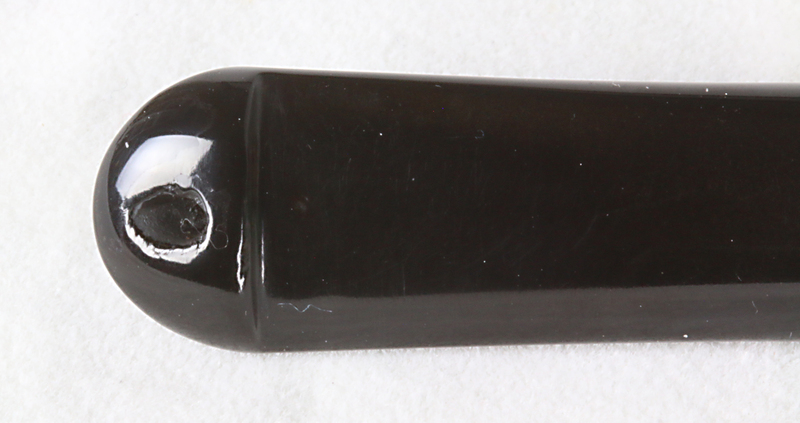 Chamber Depth: 1.23 in./ 31.2 mm. Chamber Diameter: 0.73 in. / 18.62 mm. Outside Diameter: 1.45 in./ 37 mm.